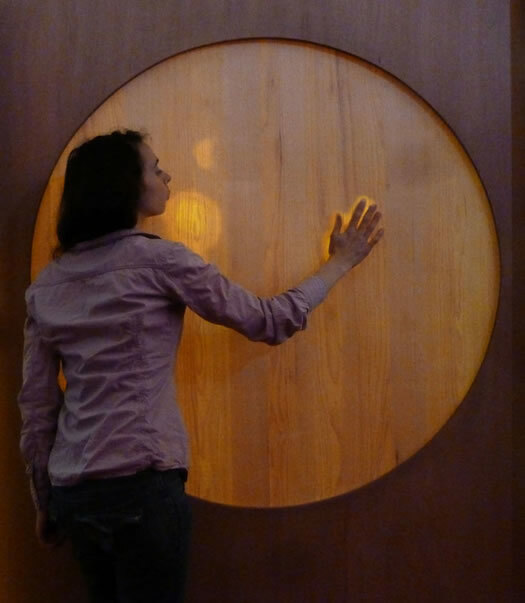 The interactive artwork " Ecorces" invites to virtually hollow out memories and layers inside the flesh of wood. The notion of "écorces" (barks) refers to the skin of the tree as well as to the skin of the human body, as a surface of appearance, at the same time protective and fragile. 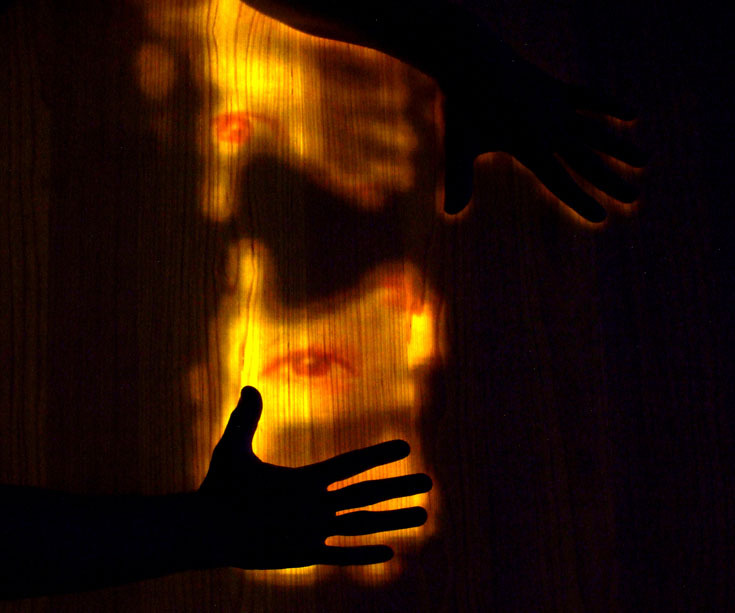 Bodyprint and handprint's heat of the spectator reveals, makes visible and audible. The heat from the breath also reveals sonorous matters from various interactive zones of this piece of wood. The wood surface is like a matrix of coordinates. Different combinations of interactions influence sonorous variations of sequences in a polyphonic composition. 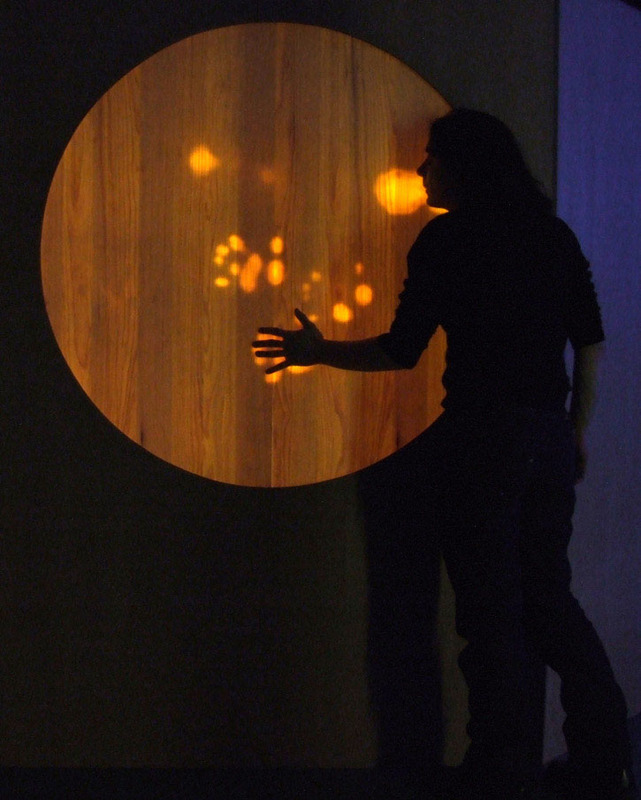 Woodfibres of this wood sheet (mapple veneer) are sublimated through a virtual and luminous videoprojection. Heat contacts of spectators leave sonorous and luminous traces. This relation with wood reveals video sequences of bubbling matters (water from river, fluids, blazing fire ..) which evokes the fluid movements of of what seems frozen. Each heatprint allows to animate a possible memory of the wood. Actions of the audience awake musicality and virtual light. Each heatprint with the wood generates an evanescent light which looks like a flame, a combustion. The hearth of light is created by the heat of spectators. When nobody touches the sculpture, this one is extinguishing slowly, with the evaporation of visual and sonorous matters. In continuity with our artistic approach in which the perception of various energies of the body are augmented, this artwork suggests an interrelation between wood, sound, light and human heat. 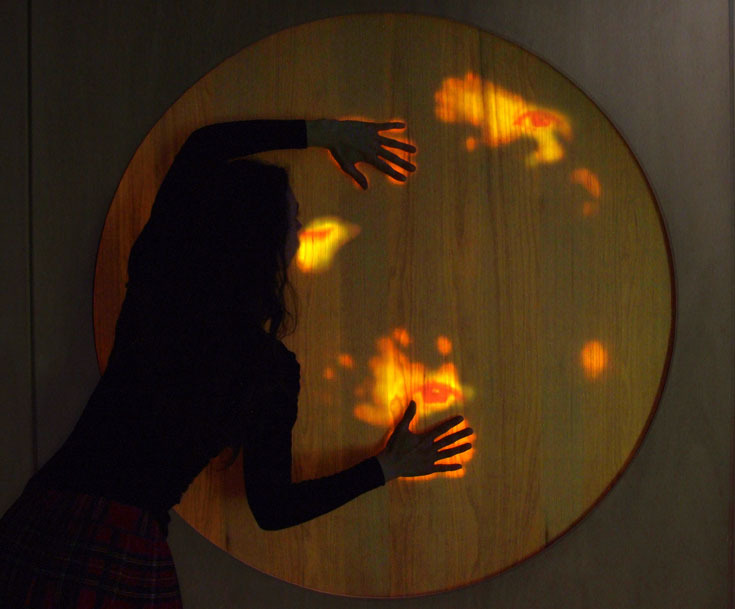 This tactile, visual and musical experience makes this shadow of body heat sensitive in order to use it as an interactive element with the wood. 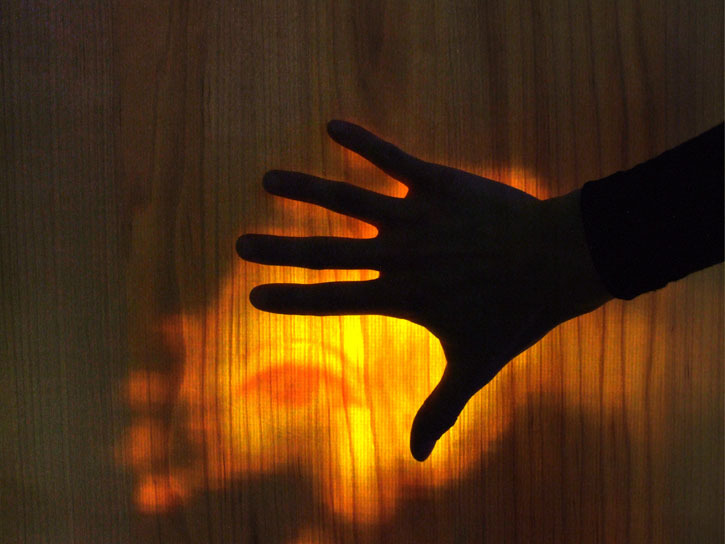 The tactile surface of interaction is made with a structure of fine wood sheets (mapple veneer) which are themselves surfaces of videoprojection. As this veneer is very thin, we can use it with the light of the videoprojection. All the technological and technical aspects (videoprojector, thermal camera, computer) is hidden from the public behind the wooden sculpture. 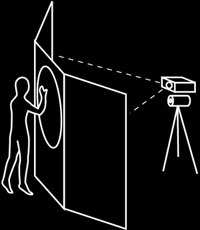 The thermal camera enables us to detect presences, juxtapositions of hands and actions of spectators on the wood membrane. We draw a parallel between detection of the heat produced by the spectators' bodies in contact with the wood and the light generated. In this artwork, evanescent matters look like the light of a candle, of a fire hearth. This light gathers the spectators around the artwork. Software applications analyze in real-time images that are captured by the thermal camera and produce visuals and sound compositions according to interactions of the audience.